A Carmelite vocation is very important and I am here to help you discern your Carmelite vocation. Have you read our website and feel a call to look deeper into our life? 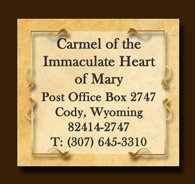 Please contact me and I will help you to discern if Our Lady of Mt Carmel is giving you a vocation to our Carmelite monastery. Please answer the few questions below and be assured of my daily prayers for you. Do you like community life? Do you go to Confession and Mass regularly? What interests you about our community?